—This article by Jerry Cates and Tom S., first published in December 2008, was last revised on 6 July 2012. © Bugsinthenews Vol. 09:12(01). Tom sent me this photograph of a brown recluse spider his wife had earlier found in their garage, on 09 December 2008. Earlier, along with some photos of a green lynx spider, Tom mentioned that his wife had found a recluse spider in a box of blankets stored in the garage, and offered to provide photos. In 28 years of collecting spiders in Central Texas, including the area around Lake Travis, I’d never found a recluse spider here, despite the fact that Willis J. Gertsch and Franklin Ennik, in their landmark 1983 paper (on The Spider Genus Loxosceles in North America, Central America, and The West Indies, which was published in the Bulletin of the American Museum of Natural History Vol. 175, three years after I began collecting spiders in Central Texas) cites a number of specimens that were collected in the Austin, Texas area. Naturally I was impatient to see Tom’s photo. Tom’s photo is clearly of a recluse spider in the genus Loxosceles. 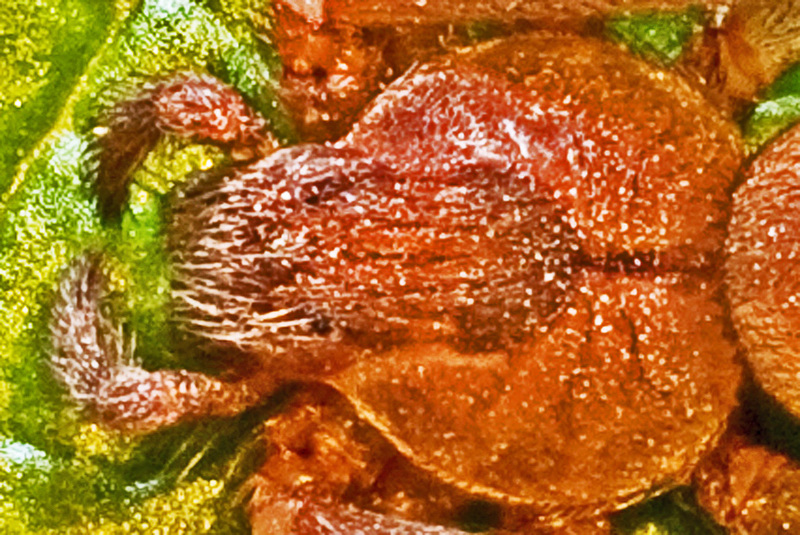 It is also a female, judging from the absence of emboli at the distal ends of each palpus (the diminutive, leg-like appendages projecting forward of the face, one on each side of the spider’s head). 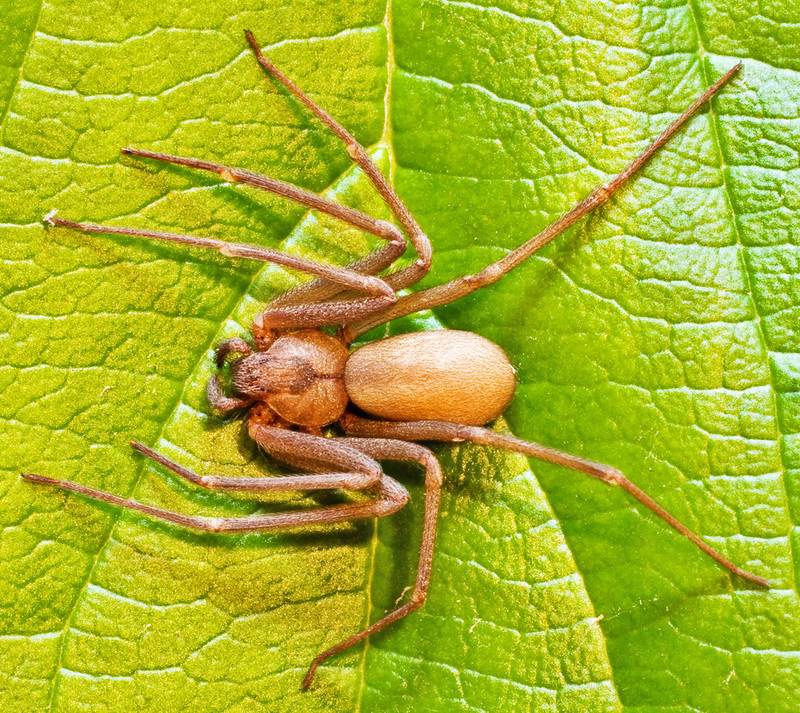 It should be pointed out that the leaf on which this spider reposes in this photograph is not representative of the habitats in which brown recluse spiders are generally found. In fact, this specimen most likely felt quite out of its element, for a number of reasons that will be elucidated later in this article. Tom put some leaves in the small container he was keeping this spider in, thinking it would make for a more comfy environment. While the leaves weren’t necessarily harmful, these spiders are known to prefer dry–even dessicated–locales to the humid environs that botanicals thrive in and, via transpiration, inevitably produce around them. Take note of the flat, pyriform (pear-shaped) carapace–the forward, upper portion of the spider’s body. Next notice the hirsute (hairy) pars cephalica–i.e., the region of the carapace that constitutes the head–that is darker than the glabrous (essentially hairless) pars thoracica–the region of the carapace behind and on each side of the head. It happens, by the way, that the hairs on the pars cephalica are arranged in distinct longitudinal rows, seven–count them–in number. In this specimen the pars thoracica is divided into left and right halves by a dark, longitudinal, thoracic furrow with a measurable width, at least visually. 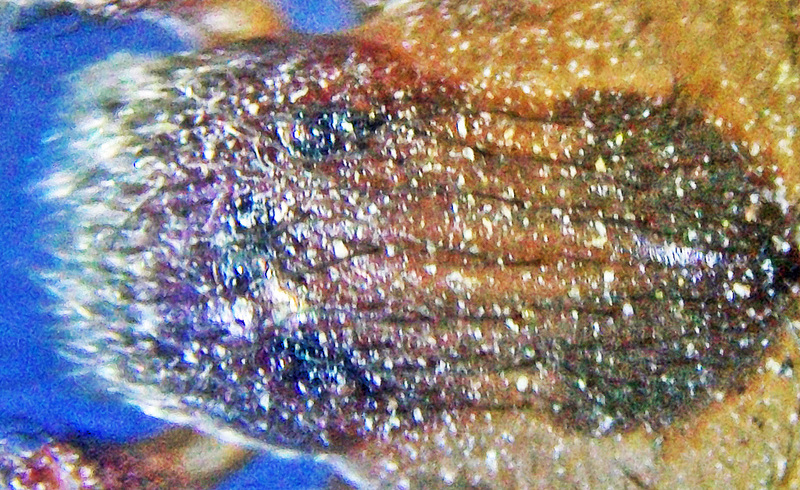 The distinctive pars cephalica, and the darkened thoracic furrow (or fovea)–in combination–are responsible for composing the famous fiddle-shaped marking on the carapace of the brown recluse spider. Now note the brown, unmarked dorsal abdomen (recluse spiders have no markings on their dorsal abdomens); and the long, slender legs that appear to be of roughly equal lengths, bereft of spines, drawn back and slanting to the sides when the spider is at rest (recluse spiders have slender legs without conspicuous spines). The generic name, Loxosceles, is derived from the Greek adjective λοξος (slanting, crosswise, oblique), and the combining form -σκελης (leg). The crude similarity to another Greek combination with the meaning “with equal legs” is so compelling that some have thought this generic word to refer to “equal legs,” particularly inasmuch as these spiders do seem to have legs of somewhat equal lengths. However, “with slanting legs” is most likely what was intended (see Ubick et al, , p. 222-223, 303). These spiders, when at rest, draw their legs inward in a characteristic slanted, oblique arrangement, unique to the genus, which arrangement is depicted in the photo Tom provided. As a child growing up in Kansas, Missouri and Illinois in the 1940’s and 1950’s, I saw many such spiders, all of whom were dead, in storage boxes of various kinds. My memories of those discoveries recall the peculiar arrangement of the legs, drawn up so the spider is preserved within a rather narrow plane; the rest of the spider’s body did not make any similar impression on me. An enlargement of the anterior pars cephalica, shown in the second image of this article, depicts what I believe to be six small, cryptic eyes in three diads (pairs), apparently obscured by cephalic hairs. I say “believe to be” rather than “what are” because, unless I knew where to look and what to look for, nothing in this photo is truly suggestive of eyes. Is that because they are obscured by the cephalic hairs? Or rather because the eyes of this specimen are simply diminutive in structure, unlike the eyes of the typical brown recluse spider? Several months later I was able to secure this specimen from Tom, and later examined it under a dissecting microscope. The eyes, it turned out, are not so much obscured by cephalic hairs as actually diminutive in structure. This brown recluse is either blind or nearly blind, with eyes that appear to be deformed or atrophied. My guess is–and this is just a guess–the genetic makeup of this spider has been adapted via natural selective processes, over a considerable period of time, for reduced eyesight in favor of some other faculty, most likely one adapted to life in dark caves or similar environments. This may seem paradoxical, given that eye structure and positioning on the pars cephalica figure prominently in classifying this spider to the genus Loxosceles. However, good students of nature in general, and students of biology in particular, soon learn to expect variation within the animals and plants they study. Sometimes those variations are striking, as in this example. Compare, for example, the pars cephalica of Tom’s specimen (above) with that of a brown recluse specimen sent to me on 26 August 2010 by Jane T., of Joplin, Missouri (shown at left). Here the eyes are typical of what we would expect when examining the head of a brown recluse spider. They stand out remarkably well. One needn’t search diligently for them at all. The matter of the eyes notwithstanding, all other features point to Tom’s specimen being a recluse spider, and–in accord with the drawings of Gertsch & Ennik (1983), pg. 175, a brown recluse (Loxosceles reclusa). I should mention, though, that at least thirteen species of Loxosceles spiders are found in North America, and though external evidence is suggestive of the aforesaid species designation, these various species are best distinguished via microscopic analysis of their internal genitalia. We can from the photo Tom sent in safely conclude that this is a female, inasmuch as the palps are typical of the female and not swollen distally, as would be the case were this a male. On the other hand, the brown recluse spider photographed by Kurt, in Collin County, Texas, could not so safely be sexed. Notice the similarity with the recluse spider photographed by Ralph E., in Wichita Falls, whose cephalic hairs also “seemed” to obscure the eyes. 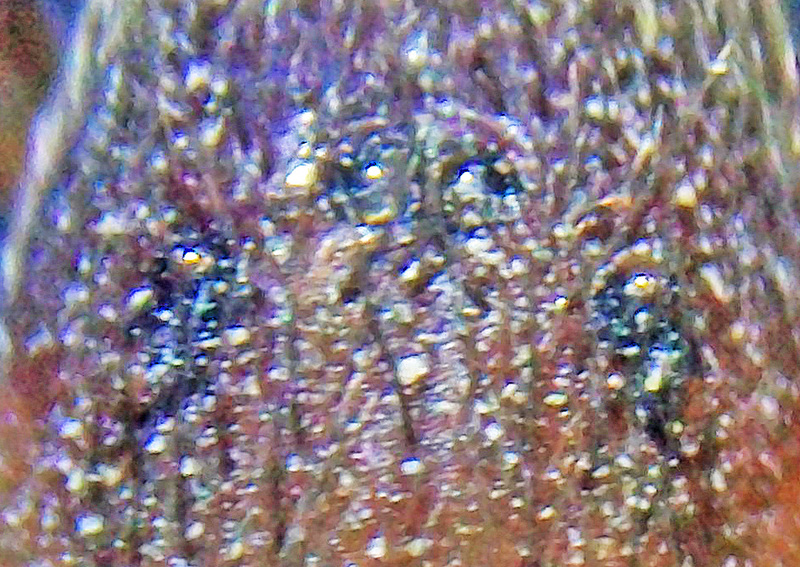 Unfortunately, in that example the actual spider was not available for closer examination, so, unlike this one, whose eyes can be examined microscopically (see the photo below, taken under the microscope on 4-2-2010) to show that, in fact, the cephalic hairs are not in the way at all. More than likely, the same result would have obtained with Ralph E.’s specimen, though we cannot be certain. It is a fact, however, that in the typical recluse spider even a profusion of hairs around the eyes would not suffice to obscure them. Thus, although most authorities emphasize that “the best way to identify a recluse spider is to count its eyes,” getting a good count isn’t always possible, as examinations of Tom’s and Ralph’s specimens clearly attest. 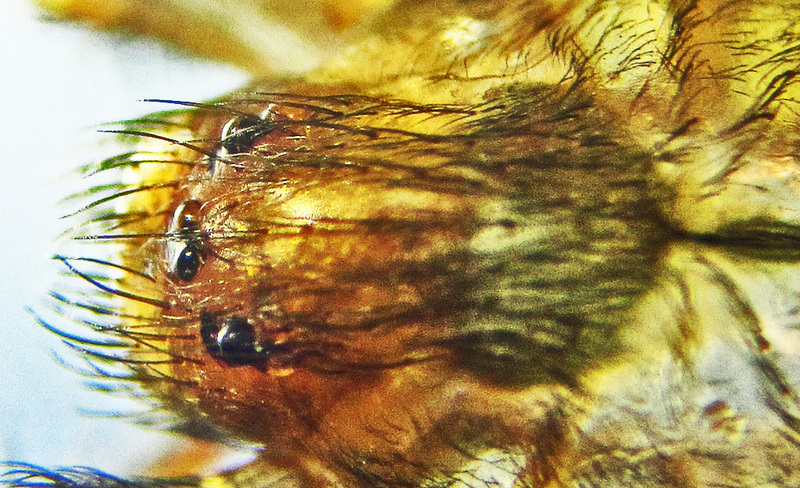 Tom kept the specimen alive in a secure terrarium, the floor of which was strewn with leaves, and he planned to take close up photos–of the anterior portion of the pars cephalica and other portions of the spider’s anatomy–after the holidays. However, inasmuch as he is a busy professor and department head at a major Texas University, he was unable to take time to do that for me. In the end, I made arrangements to drive out to his home, survey the area, and pick up the specimen. Tom didn’t initially say where the box with this specimen came from. He did report having found one other in his home several years ago, though. The box of blankets his wife found this one in had been packed with blankets, at this home, several years ago. This alone is sufficient evidence to establish that the spider was not imported, in this box, from another location. The box remained unopened until recently. The obvious conclusion from this is that the spider entered the closed box from the garage environment, most likely after entering the garage from the surrounding landscape, and almost certainly within a few months prior to its discovery. Where, then, might this spider have come from? One sensible possibility is that it came from the surrounding landscape, as an opportunistic invader from another habitat. That Tom’s home is not, in general, all that inviting to brown recluse spiders is attested to by the paucity of brown recluse spiders found there, despite evidence that it has hosted solitary specimens from time to time. This female, for example, did not immediately take up housekeeping in that home–where it could easily have produced prodigious numbers of young. Instead, it hid away, in a tightly packed box of blankets. Tom S. and his wife live in an idyllic setting. Their home is surrounded by heavily forested countryside and backs up to the shoreline of Lake Travis. The home is much higher than the lake, being positioned on the rim of a hill on the lake’s periphery, and one might suppose from this fact that a handsome view of the lake would be well at hand. But no, one would never know that Lake Travis is close by, just by sitting on Tom’s comfortable back porch. The forest behind Tom’s home is so thick all visual evidence of the lake is obliterated by the lush vegetation. You notice that the back yard slopes gently downward, but where it goes is a mystery, as the view is lost less than a hundred yards in the distance. Perhaps as pertinent, this area is underlain with honeycomb limestone rock, riddled with cracks, crevices, small cavities of various kinds, and–more than likely–even large, unexplored, subterranean caverns. None of that is any more visible than the lake, but it is all there nonetheless, and–largely unbeknownst to the humans who inhabit the surface–it teems with life. Diverse environments that contain a profusion of vegetative forms, that are established on equally diverse geological structures, and which are blessed with an abundance of the vital ingredients necessary to support a wide variety of organisms, should yield interesting mixes of animals that represent a broad range of taxa. Back in the early 19th century, when itinerant naturalists scoured America’s then-primitive nooks and crannies to collect and classify specimens of its animal life, they looked upon settings such as that found in Tom’s back yard as rich resources from which they could mine multitudes of interesting plants and animals. We tend to think such places no longer exist in America, today, but that is incorrect. They are, in actuality, all around us. Tom’s is one of those. In the depths of such an environment, a spider needs eyes like–well, as some might put it–a fish needs a bicycle. A short discussion on dealing with brown recluse spider infestations in residential homes is presented in the article on Ralph E.’s brown recluse (Wichita Falls, Texas). In the interest of stamping out redundancy, I refer those of you with an interest in such things to that article. It should be pointed out that resolving brown recluse infestations in homes is not difficult, once the proper procedures are understood. In each of the cases with which I’ve personally been involved, it was possible to successfully return the infested homes to their pre-infestation conditions within a matter of days. An informative article on my experiences helping a family in the southeast corner of Wise County, Texas, whose home was infested with brown recluse spiders, is in preparation, and should be ready to publish soon. I’m also working very closely with a family in Joplin, Missouri, whose home had hosted–until recently–a relatively robust brown recluse infestation. An article on that project is in process and should be published sometime in January. With specific reference to Tom’s home, it should be obvious that two witnessed incursions of this species, over a period of several years, does not an infestation make. Accordingly–no pest management at his home specifically targeting this spider appeared warranted. I do plan to visit the site again, however, in hopes of collecting additional specimens of Loxosceles spiders from the landscape, particularly if–as I suspect to be the case–there happen to be a few small caves on Tom’s property that can be accessed from the surface.